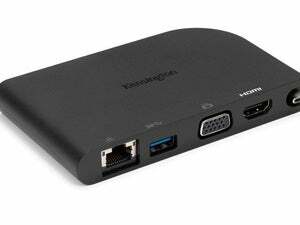 An attractive small package bundles 4K video, USB 3, and passthrough power at an affordable price. Passthrough power was initially rare for USB-C docks, which were designed to extend the single port on a 2015 and 2016 MacBook. This was unfortunate, because a dock should be a way to get more out of a laptop without watching the battery drain. 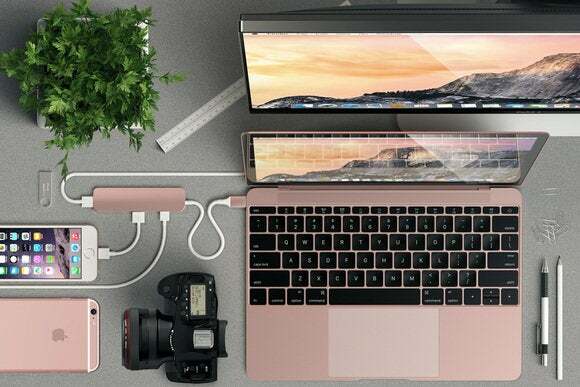 The Satechi Slim Aluminum Type-C Multi-Port Adapter ($60 on Amazon) is part of a wave of docks that started to appear in mid-2016 that are both affordably priced and can make use of an Apple or a third-party USB-C charger while offering extensibility. The Satechi is a neat combination of aesthetics and function. The rounded corners are nice for a unit you’ll drop into a bag, and the aluminum finish (available in four colors) can match or complement your Mac. Utility matters, too. The built-in cable has reinforcement at the dock connection and the head. The USB-C jack is in an aluminum case for durability and stability, and it fits snugly into a MacBook. The cable itself has a heavy duty flexible coating. All of that should combine to make it stand up well to wear and tear. I tested a newly-erased external USB 3.0 solid-state drive with the dock’s USB 3 Type-A ports, and was able to get the maximum read (400 MBps) and write (300 MBps) speeds, even connected to the 4K display, which can reduce the number of data lanes available on the USB bus. The only downside to the dock is minor and didn’t come up in testing. Each Type-A port can provide no more than 1 amp (A) of power, and combined, the dock shouldn’t exceed 2A. The HDMI output and USB-C power passthrough don’t count against this. USB devices should “handshake” with a port on a computer, dock, or hub to figure out how much power a device can obtain from the port. But Satechi says that a higher-amperage USB device could try to pull more current than the dock can handle without shutting down. In testing, I didn’t see this even with a bus-powered SSD attached that formatted itself over several hours and an iPhone 6s charging via a Lightning cable. Some other docks I’ve tested seemed to shut down much more readily based on power pulls; that didn’t happen with the Satechi. There’s a lot to like about the Satechi Slim Aluminum Type-C Multi-Port Adapter, including the price. 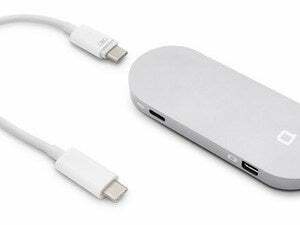 At $60, it’s $20 less than Apple’s less robust and less capable USB-C Digital AV Multiport adapter, which has an awkward dongle shape and one fewer USB 3 Type-A port. If you just want to be able to charge or attach two USB devices and have the option for up to a 4K display, the Satechi is an attractive pick. 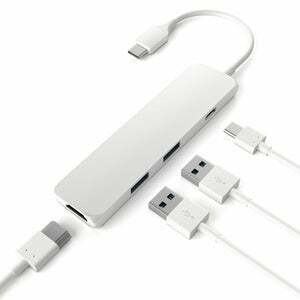 There’s a lot to like about the Satechi Slim Aluminum Type-C Multi-Port Adapter. 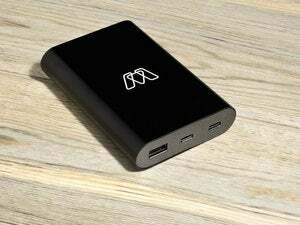 It lets you charge or attach two USB devices and supports a 4K display.